With the majority of the costing exercise behind me, I started to make use of the new economical values in my module by starting to work more with some of the shops and trades that will be available in the game. As mentioned in a previous post, each trading place will open with an additional "store" information GUI, giving extra details for the place, such as maximum buying prices, identify costs and limits to the store's gold. In addition to this, I have now created a system that randomly adds new stock items and informs the player of such in the new GUI. New stock may simply be other useful items, or may be a special item that will add more to the game. Note, however, items that don't sell will be removed from stock after a time and new items added, so if there is an item you want and you have the gold, buy it! The system already works well, and all I have to do now is customize some new stock items for the various shop types and consider adding extra code to the system that decides how to handle items sold to the store from the PC. Another system that I finished this week was the Party Map system. Readers of the blog may recall that I do still intend to use the map systems from both NWN2/MotB. Each system is used in a different way according to what the PC has discovered. However, I have also adapted the code to allow PCs to acquire map items and view them as a party (including MP mode). The map displays locations discovered and gives some information about them when selected, but the "Travel To" button is disabled to prevent a quick escape from a dungeon environment. The idea is to allow PCs to look at a map together and discuss options similar to old PnP style play. With the release of patch v1.23, I have been able to make use of some of the new functions, including the GetBaseMaterial to determine what material an item (in this case a weapon) is made from. This is useful to me, as it means I can determine what properties may still be available to a weapon that has degraded. i.e. Dead Weapons (*) degrade in my game. However, if a weapon is made from a certain material (e.g. adamantine), then any properties associated with the material in its construction are not lost, as opposed to magic weapons that may have had 2-3 properties on them, but have been lost with weapon degradation and lack of care. This means, of course, that sometimes it may pay to have a weapon made of a certain material, as its properties may last longer than a weapon made from iron that has been enchanted. NB: There are means to keep a weapon in good condition and not lose any properties. Also, Living Weapons, by comparison, do not degrade with use. (*) The term Dead Weapon will become more obvious when playing the game. With the release of patch v1.23, I also want to make a slight alteration to my optional Auto-Pause Combat System. At the moment, the system works well, but now that instant feats have become available in the latest patch, I would like to make the new "feat" instant in response, as opposed to have an action delay time. However, the new feats.2da supplied with the patch failed to have the new column added, which means although the facility is there, I cannot make use of it until I have managed to edit the 2da file and added a column. I have told it should be possible using Excel, but at the moment I have not had much success. I guess Atari will release the file separately at some point. Even so, I think this new feature of instant feats will be a great blessing to the community. After patching to v1.23, I found that when I entered Character Mode in game, that I could no longer look upwards, like I could prior to patching. I was about to reinstall the entire game when I had a thought about allowing NWN2 to rebuild the NWN2player.ini file after I deleted my version. Thankfully, after doing this, the game worked again just fine. I know one of my players was also struggling with one of his playing modes, so maybe this might be a fix worth noting for future reference. NB: I don't think the fault was as a deliberate result of the patch, but in my case, it did occur at the same time. pity... I would currently welcome a patch that prevented PCs from looking upward: I have made an area completely covered with the leaf canopy placeable rescaled to huge proportions. The dappled shade effect on the ground is amazing, but when you look upward to the sky... my god, it's ugly!!! Why does it look ugly? I would have thought it would have given a good effect looking to the sky through the trees. After all, I thought NWN2 had resolved all issues of objects when looking upwards. Anyway, I am sure players will choose to play a mod the way it looks best. :) Otherwise they would be spoiling it for themselves. 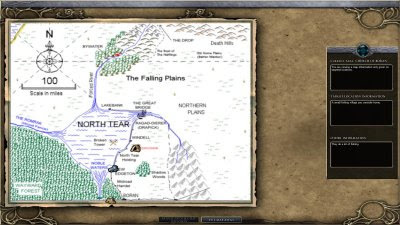 I always thought that the map did not quite look right in NWN, so it sounds like you have the answer. The icons won't matter as they are added to the map image independantly anyway (in the map editor). Email me or respond to this post so I know you have got this reply ok.